AMW Bulletin: Benefit's Hi San Francisco! Our friends from Benefit have something exciting in store for everyone! Exclusive meet and greet, makeup session/lesson and photo shoot with gorgeous Benebabes and Global Benefit authorities Maggie and Annie Ford Danielson! 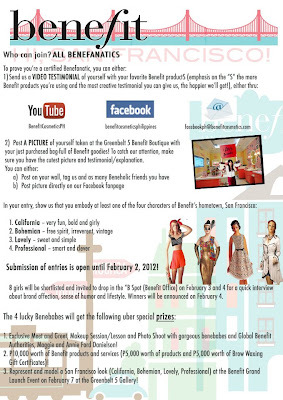 Represent a model a San Francisco Look (California, Bohemian, Lovely, Professional) at the Benefit Grand Launch Event on February 7 at the Greenbelt 5 Gallery! Feel free to click photo to enlarge and read more details or visit Benefit Cosmetics Philippines FB Page for updates!